Leaf-miner: A relatively large, ribbed, oval egg is deposited near the base of the needle, on the outer, convex, side. The emerging larva at first makes a wavy, epidermal, corridor, running in the direction of the needle tip. Soon the gallery becomes deeper and fills the entire needle. The larva works itself to close to the tip of the needle; the mine behind it is almost completely filled with frass. Pupation external; the exit opening is just under the tip, in the flat side of the needle Bladmineerders van Europa. The larva feeds internally in a needle, working its way from the base to the tip. It may then feed externally in a slight web (UKMoths). During the mining phase the larva is orange red, but on emergence is shiny green (British leafminers). 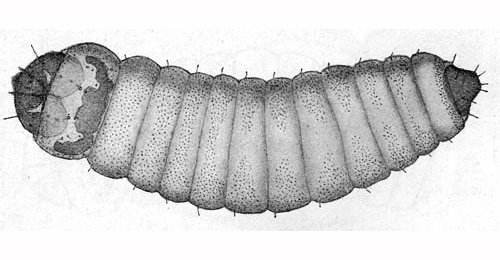 The larva is illustrated in Bladmineerders van Europa. Pupation in a white cocoon on the ground. The pupa is initially green, then darkens as it matures (British leafminers). The pupa is illustrated in Bladmineerders van Europa. Time of year - larvae: March - April (British leafminers). Time of year - adults: The adults fly in June and July, when they can be attracted to light (UKMoths). Distribution in Great Britain and Ireland: A widespread but local species occurring over much of England and Scotland in its favoured habitat, pine woodland (UKMoths), including Bedfordshire, Dorset, Durham, East Ross, East Sutherland, Easterness, Elgin, Hertfordshire, Kincardineshire, Linlithgow, Middlesex, North Hampshire, North Somerset, North Northumberland, Nottinghamshire, Shropshire, South Aberdeenshire, South Northumberland, Stafford, Stirlingshire, Surrey, West Lancashire, West Norfolk, West Perthshire, West Suffolk and Westmorland (NBN Atlas). Distribution elsewhere: Widespread in continental Europe including Austria, Belarus, Belgium, Bulgaria, Czech Republic, Danish mainland, Estonia, Finland, Germany, Greek mainland, Hungary, Italian mainland, Latvia, Lithuania, Luxembourg, Norwegian mainland, Poland, Romania, Russia - Central, North and Northwest, Slovakia, Spanish mainland, Sweden, Switzerland, The Netherlands and Ukraine (Karsholt and van Nieukerken in Fauna Europaea).